OK, so I was very brave the other day. I tried a meal that was so strange, I couldn’t belive my taste buds. Before I tell you the details of how to make it, I’ll tell you how the idea sparked. So the other day I was talking to one of my partners in internet social corruption, The Primal Root. He was telling me about his plans for the night, when he mentioned he was going to have his favorite hamburger treat. It was a Hamburger topped with banana, pineapple, and peanut butter! I was just dumb founded. How do you figure out these things go well on a hamburger? It was then I made the solemn promise to try this for myself. After all, I pride myself on the unusual tastes that I myself posses (Oriental Meatloaf anyone…?) I even said I would make it a custom meal devoted to tastes inspired by him. I added to this meal a drink Root introduced to me a couple of years back, called the Stiff Root. What was the verdict? Absolutely delicious! The Flavors in this meal were off the chart! The hamburger had such a different, but very cool taste to it. The peanut butter, pineapple, and banana’s complement each other so well…it was divine. Couple that with a nice glass of Stiff Root and a side of Nathans fries…it was just awesome. Want to make one of your own? It’s important to know I will never give you exact measurements on spices. I myself do not know how much i put in. I just season to taste. 1) Mix 1bs hamburger meat with one egg, onion powder, garlic powder and pepper in a bowl. Roll into balls and then make into patties. It will yield 4 medium-sized patties. Cook them on a skillet on high heat to preference. 2) Spread peanut butter on both sides of the bun. 3) Cut banana into slices. Place on the peanut butter. 4) Spread pineapple on top. I used Crushed, but really it doesn’t matter. Stiff Root is Half and Half Jagermeister and Root Beer Schnapps. Serve in a glass for full effect. 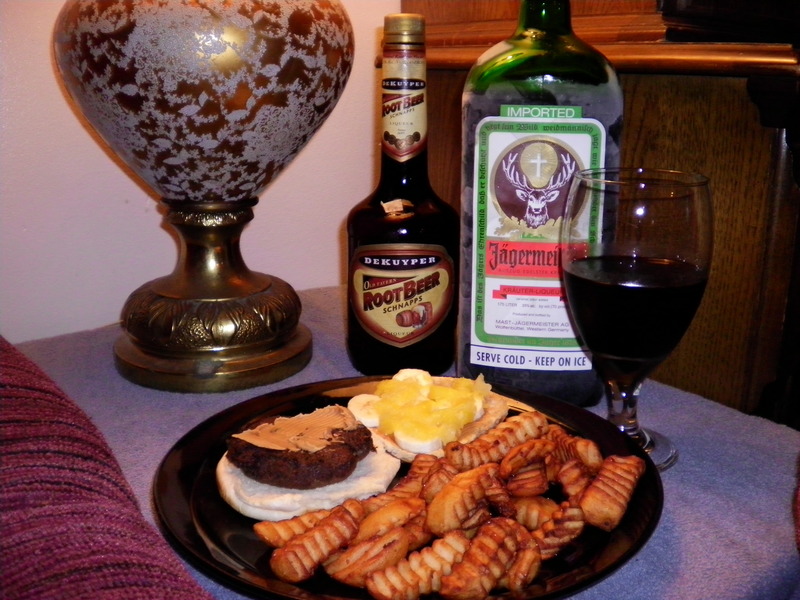 If your brave enough to try it, I promise a good meal…and a pretty good buzz too! This entry was posted on August 14, 2010 by malicepsychotik. It was filed under Ramblings of a Mad Man and was tagged with Bannana, Burger, Drink, Food, Jager, Recipe.